Dr. V. Balaji is affiliated with Princeton University’s Cooperative Institute on Climate Sciences. 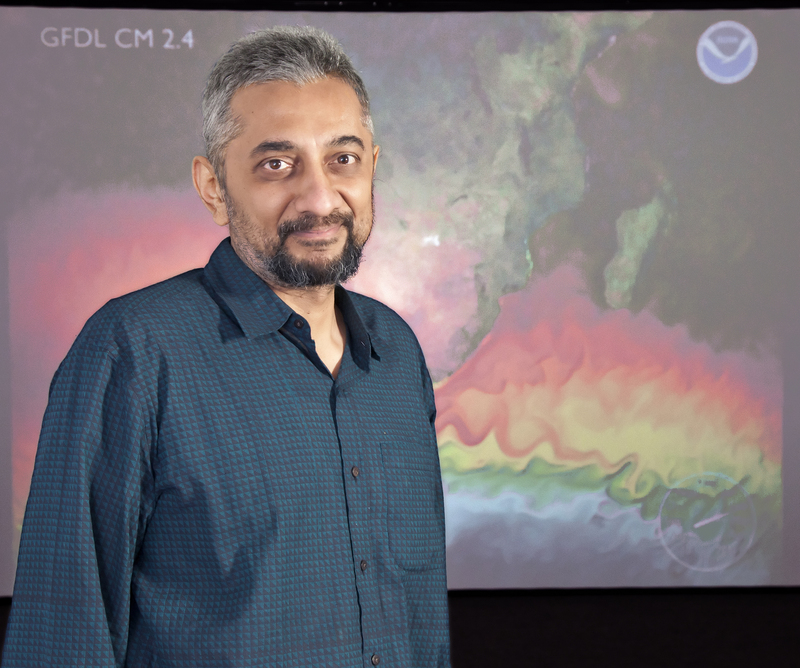 He has headed the Modeling Systems Group at NOAA’s Geophysical Fluid Dynamics Laboratory since 2003, and is Associate Faculty at the Princeton Institute for Computational Science and Engineering (PICSciE). With a background in physics and climate science, he has also become an expert in the area of parallel computing and scientific infrastructure. He is co-chair of the WGCM Infrastructure Panel (WIP), tasked with developing the scientific requirements for the global data infrastructure underlying the Climate Model Intercomparison Project (CMIP), a pillar of the IPCC Assessment Reports of the state of the Earth’s climate. He was an author on the 2012 National Academies Report A National Strategy for Advancing Climate Modeling and the 2016 National Academies Report, From Maps to Models: Augmenting the Nation’s Geospatial Intelligence Capabilities. He serves on the Scientific Advisory Board of the Max-Planck Institute for Meteorology in Hamburg, the Scientific Advisory Panel for the National Center for Atmospheric Research (NCAR), as well as for DOE’s Accelerated Climate Modeling for Energy (ACME) Project, and chairs the Advisory Panel for NCAR’s Computing and Information Systems Lab (CISL). He is a sought-after speaker and lecturer and is committed to provide training in the use of climate models in developing nations, leading workshops for advanced students and researchers in South Africa and India. Requirements for a global data infrastructure in support of CMIP6, GMD Discussion Paper, 2018. Causes and Probability of Occurrence of Extreme Precipitation Events like Chennai 2015, J Climate 2018. Eutrophication will increase during the 21st century as a result of precipitation changes, Science, 2017. CPMIP: measurements of real computational performance of Earth system models, CMIP6 Special Issue, GMD 2017. The art and science of climate model tuning, BAMS 2016. Coarse-grained component concurrency in Earth system modeling, GMD 2016. Climate Computing: The State of Play, CiSE 2015. Scientific Computing in the Age of Complexity, ACM 2013. From Maps to Models: Augmenting the Nation’s Geospatial Intelligence Capabilities, National Academies, 2016. A National Strategy for Advancing Climate Modeling, National Academies, 2012. Member, Scientific Advisory Committee, DOE Accelerated Climate Model for Energy (ACME) Project.